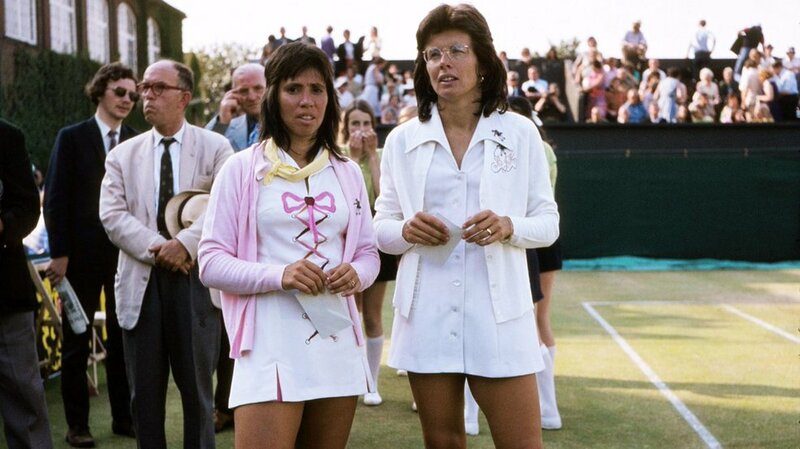 As the broadcast of the “Battle of the Sexes” between Billie Jean King and Bobby Riggs got underway, ABC play-by-play man Howard Cosell draped his arm over the shoulders of his female analyst, Rosie Casals (in the newly released film, played by Natalie Morales). Looking back on it now, the 69-year-old Casals told me, “That was my personality. I was playing the battle of the sexes in the broadcast booth. Howard knew nothing about tennis. He would interrupt me. But I would make my point. I was encouraged to be that way.” Casals also predicted that King would win the match 6-4, 6-3, 6-3 – which in the end, turned out to be spot on. But then again, around King, Casals was always aware of the score and the stakes. They’d first met in Northern California in the fall of 1964 at the Berkeley Tennis Club, the venue that at the time was the epicenter of tennis in the San Francisco Bay Area. Casals had just turned 16, a preocious shot-maker from San Francisco. Billie Jean Moffitt was 20 years old and a year earlier had been ranked number four in the world (a year later she would marry Larry King). Awestruck by Billie Jean’s world-class manner – the crisp clothes, the elegant racquets, the way she carried herself as a champion even before she’d yet won a singles major – Casals dubbed her elder, “The Old Lady,” a term that also hinted at Billie Jean’s role as the senior partner in the world of women’s tennis. Because she saw herself as a big deal, Billie Jean wanted tennis to be a big deal. In this sense, Billie Jean was similar to Riggs: a hard-charging Southern Californian who had a vision that tennis could become more popular. Casals had her own ambitions. By 1966, still in her teens, she’d cracked the top ten. Four years later, she was ranked number three in the world, just behind Margaret Court and King. Having come of age on the public parks of San Francisco, most notably at the famed Golden Gate Park, Casals had built a bold, aggressive game that belied her size. “I figured I better do something to them before they did it to me,” Casals said of her playing style. Dangerous and streaky, Casals by 1967 joined forces with King to form one of the finest doubles teams of the Open era. Between 1967 and ‘74, the two won seven Grand Slam titles. All told, Casals would win 12 majors, a staggering 112 doubles titles and finish in the top ten for 12 straight years. Those achievements would earn her a spot in the International Tennis Hall of Fame. When the time came in 1970 to start the Virginia Slims Circuit, Casals was front and center – as player, as activist, as promoter. World Tennis magazine founder Gladys Heldman had found the sponsor and ran the tour. Among the players, of course, Billie Jean was the leader. But also, unquestionably, her first officer was Casals – doggedly loyal, devoted to the cause. So it was that the “Battle of the Sexes” had been won on the playing fields Casals, King and the other seven members of the “Original Nine” had trod upon for nearly three years. Said Casals, “We changed not just women’s tennis, but women’s sports, women in the work force – everything.” From early morning radio programs, to sticking leaflets under car windshields in shopping center parking lots, to sponsor parties, clinics and Pro-Ams, it had been a frequently sleepless and uncertain journey. But for Casals, it had also been the best time of her life. Coming next: Bobby Riggs’ right hand man.